John William Handley was born at Hooton Roberts near Rotherham in 1881. 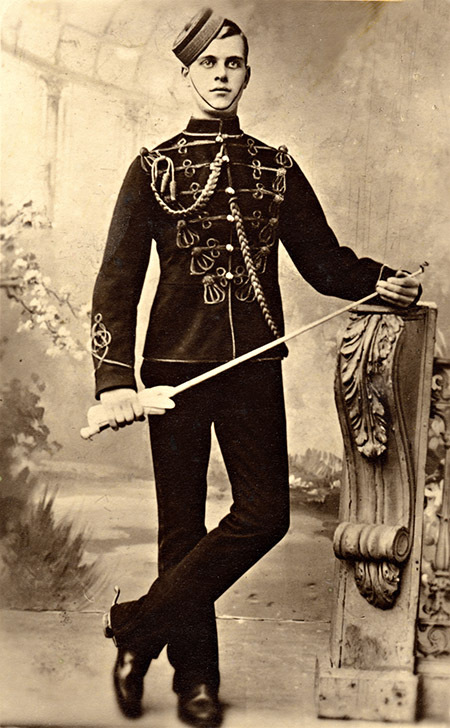 In 1900, he enlisted with the 3rd Hussars. From the 14th December 1901 to 22nd October 1902, John William served in South Africa. The 3rd Hussars saw active service in South Africa from November 1901 (Boer War). He was awarded the Queens South Africa Medal with three clasps for Transvaal, Orange Free State, and 1902. From the 23rd October 1902 to the 26th November 1903 he served in India but was invalided back to the UK, and discharged from the army in January 1904 as medically unfit. Between 1904 and 1914 he worked as a chauffer. On the 21st January 1909, at Chapeltown Parish Church, he married Maud Ethel Crowther who was born in March 1881 in Blackpool, Lancashire. They lived with his wife’s parents at 161, Station Road, Chapeltown, near Sheffield, and produced two sons and a daughter. On the 18th January 1915, John William again enlisted in the army and was posted to 176 Company, Army Service Corps, #M2/034111. On the 31st May 1915 he embarked on the SS Connaught at Southampton and disembarked the following day in Rouen, France. He served in motor transport and on the 20th January 1917 was attached to 33rd Ammunition Sub Park. On the 28th Sept 1917 at Boeschepe, three men were wounded by enemy aircraft whilst unloading at Cambridge Dump. John William (36) was wounded in the thighs and legs. On the 29th September he died of his wounds at No.11 Casualty Clearing Station, Godewaersvelde, near the Belgian border. He is buried in the British Cemetery at Godewaersvelde, grave number I.J.10.